First off I would like to say that I am dedicating this week to zucchini. It is for all of you that have an abundant supply of zucchini sitting in your garden waiting to be made into something delicious. As for me my favorite way to make zucchini is to use it in baked goods. I do like cooking with it as well, but I have a bit of a sweet tooth and I really enjoy the zucchini in the baked goods.. 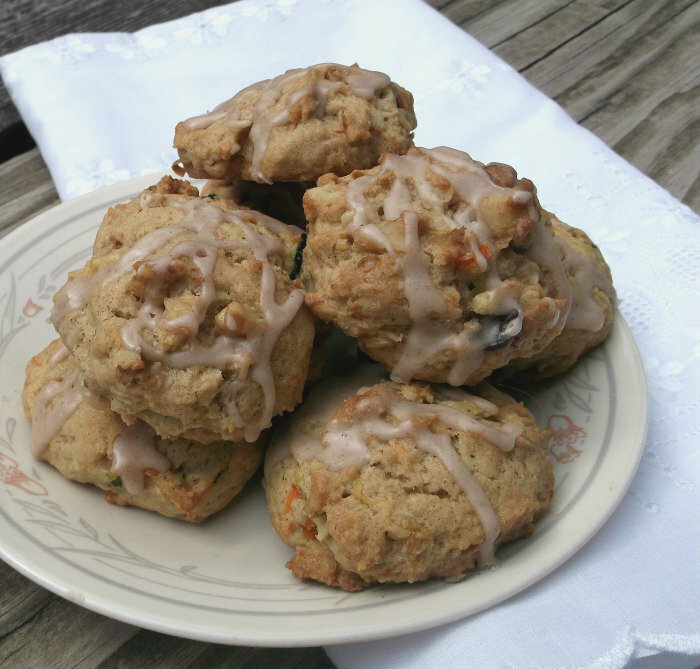 I got it in my head last week to make zucchini cookies, I wasn’t sure if there were any recipes out there for what I wanted. I did find something that fit what I had in mind, but as always I did change things around a little to go with my families taste. I decided on a simple powder sugar icing with a touch of cinnamon. Either way I thought the cookies are delicious, they are moist, but not too sweet. The touch of icing sweetened up just a bit, more to the taste that my guys like. 1. Mix together the shortening, sugars, and egg. 2. Stir together flour, baking powder, baking soda, salt, and cinnamon and stir into the shortening mixture. Mix in nuts. 3. Drop by teaspoonfuls onto greased cookie sheets. 4. Bake 11 to 13 minutes in a 375 degree oven. Put all the dry ingredients into a small bowl and mix together. Add the vanilla and milk and mix until smooth and the right consistency so that you can drizzle the icing over the cooled cookies. Dawn, I love the idea of the veggies in the cookies with the spices..look awesome! These look great! And since they are so veggie-full…I daresay they are totally breakfast-worthy! 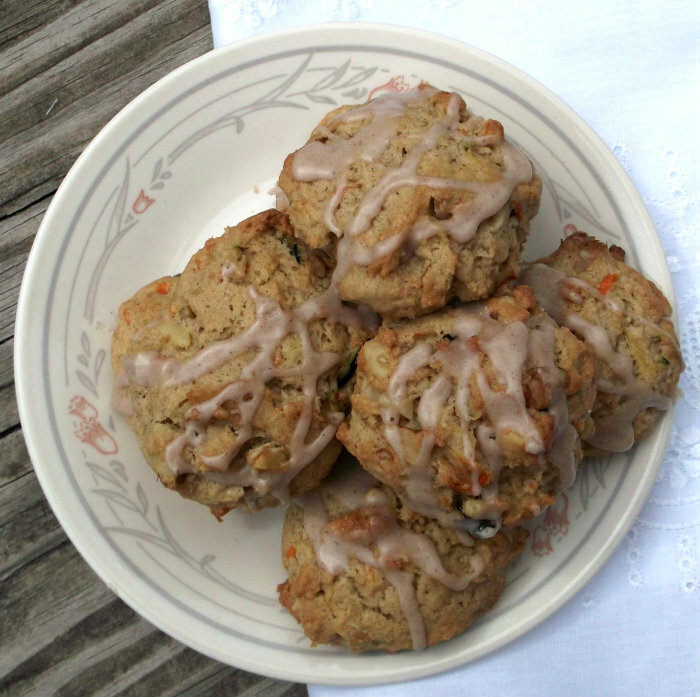 What a great idea, carrots and zucchini in cookies. I would have loved to have had this recipe when my kids were little and I was always trying to get more vegetables into them. Yup, we’ve got zucchini! Great idea for a food theme. These cookies look fantastic. We bake with zucchini all the time (bread), but not cookies – need to do this. Thanks.